Bambini is a wholesale clothing supplier based in the USA. The company was originally incorporated in Matawan, New Jersey in 1992 and has been growing ever since. Now, Bambini is based in Orange County, California and has been selling online since 1996. Bambini provides its customers with fresh and modern styles, fashion forward prints, embroidered garments, and accessories. They always listen to their customers and work to give them what they want and maintain the best customer service possible. The vision for the company is to concentrate on quality and control of fabrics, designs, garments, and accessories. Bambini works to stay up-to-date on trends and maintain their high standards for customers. 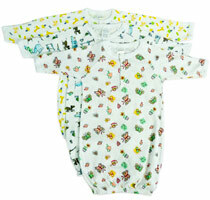 Bambini has a collection of clothes that will perfectly complete an infant layette. A layette is a set of clothing and linens for a newborn baby. Bambini uses soft fabric to create t-shirts, one pieces, tank tops, blankets, and more for infants. They have superior quality clothes at competitive prices. Some of the company’s best sellers include the white rib knit beanie and the rib knit white long sleeve lap t-shirt. Both are plain and customizable styles that are timeless. Bambini also has an online data feed with hundreds of product bundles for customers. No minimum purchase is required for resellers and there are no extra costs for shipping, just the standard shipping fee. Bambini suggests resellers sell their products for double the wholesale price and make a serious profit. Good quality at good prices from a reliable brand is not all Bambini has to offer. They also recommend promotional posters that can be mounted on store walls for display and sales. The company also offers over-stocked and discontinued items that are available for deeply reduced, bargain, and discount prices. Overstocks are subject to availability, but there are always products on hand for discounted prices. Bambini is a superior yet affordable wholesale supplier and throughout changing trends and styles, ones thing stays consistent: babies! They say “the babies never stop coming” so source from them today to capitalize on this growing industry.